My life in this 21st century brings me some surprises that I could never have predicted in that past century that made me. A few months ago I went into my phone to search in Google the latest information on the Argentine submarine that never surfaced and was never found. I also make queries about photography. So now my Google feed in my phone includes several (and interesting they are) about the politics and financial troubles of my native Argentina. There are countless articles related to the fact that because I own a Fuji X-E1 and an X-E3 I might be tempted to buy a brown one. 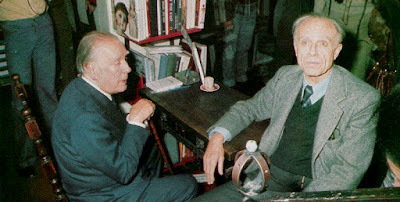 But this essay intrigued me and I read it in its entirety as it is about two Argentine authors that admire, Jorge Luís Borges and Adolfo Bioy Casares. But, I read almost at the end something that seemed to be so uncomfortingly contemporary. This is a 1972 translation of Argentine writer Manuel Peyrou’s 1949 work, El estruendo de las rosas, was translated into English by Donald A. Yates and published by Herder Publishers in 1972 as Thunder of Roses: A Detective Novel. The writer of the essay on Bioy Casares and Borges cites the appearance of General Don Domingo Perón who while had risen to power in 1946 he was consolidating power by 1949.The quote above might refer to Peron's loved "descamisados" or shirtless ones whom he gave his speeches from the balcony of the Casa Rosada. I lived those years (I was 8 in 1950) but I had a hazy idea of what was going on. I could hear Perón and Evita shouting their speeches over the radio from our neighbour’s (Peronists) loud radio. My grandmother would tell us of neighbourhood women complaining there was not meat at the butcher shop and how somehow these women were not seen again. Perhaps they had moved. I don’t know. But my 1954 my grandmother knew something was going to happen and we moved to Mexico City.